This XTV comes outfitted with some of Argo’s most popular accessories, including a front cargo rack, brushguard and a 3,500 lb. Warn winch. This XTV has a load capacity of 830 lbs., can tow up to 1,400 lbs., and seats up to 6 people. 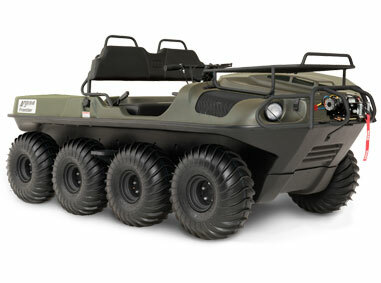 The 26 HP Kohler Command Pro V-twin easily powers the vehicle over water, dirt, sand and rocky terrain. The engine can be paired with an efficient standard or Argo’s high torque transmission to handle steep inclines and heavy loads.